It lets members tell of what and who inspires them and allows the members to directly follow the persons who inspire them. It has made resume presentation fast and interesting through the use of visual and video profiles. A member is able to make a better first impression to recruiters as video profiles are more transparent than written profiles. My Story features enables for an easy way for members to tell of their personal or professional experience. 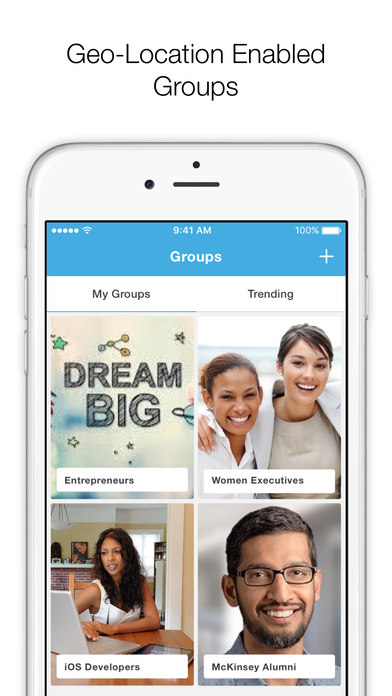 Easy and natural access to networking and career relationships. Through the use of the Dream-boards, members are able to drag and drop their visions and inspirational pictures whichever way they like in order to clearly and correctly tell their stories. Geo-location enables groups; this helps the user create groups, access groups and events based on their interests and geographical location. The feature includes trending groups, group chat, convo threads, member mentions and live member display which enables the members to keep in touch and network. Group members can also engage in personal conversations by enabling Face Time directly from their profiles. Visual professional profiles; content resumes have been replaced by visual resumes which are faster to create, allow for a transparent way for members to tell of their stories and talents. This visual feature includes a video intro, my story, a dream board which helps a member put down their thoughts and visions, inspiration which allows a member who is inspired by someone to follow them and let them know in the app, background, skills and interests. A voice enabled personal assistant; this feature connects the members to a career coach who suggests contacts and the right recruiting companies based on a user’s profession, interests and geographical location. This career coach is responsible for providing notifications, reminders and automatically scheduled meetings. While the other apps of its kind have specialized into either social or career networking sites, Yuemey has combined the features of all the other social networking apps to create one social and career networking app.